SINGAPORE companies are well-positioned to venture into foreign halal markets, particularly China’s huge domestic market, according to market insiders. Halal denotes products and services which meet Islamic consumption standards. Industry observers say Singapore players are well placed to enter China’s market and fill the gaps, with their internationally recognised halal certification and high food safety standards. In fact, up to 70 per cent of Singapore food exports are halal-certified. China’s 2 per cent Muslim population numbers some 26 million people and most live in north-west China in its Xinjiang, Ningxia, Gansu and Qinghai provinces. China had its first halal food certification centre when the Ningxia Halal Foods International Trading Certification Centre opened in January 2008. Singapore’s Warees Halal, a division within Muis’ (Majlis Ugama Islam Singapura) wholly-owned subsidiary, Warees Investments Pte Ltd, created the General Provisions of Halal Food Certification in March 2013 to certify halal food in Ningxia, Shaanxi, Gansu, Qinghai, Yunnan, Liaoning and Guizhou. According to a Euromonitor report, halal food is becoming a popular food option in China, even among its non-Muslim population who see halal food as healthy, hygienic and of higher standards. There is a growing presence of halal food in cities such as Shanghai, where there are far fewer Muslim consumers, noted Mr Lim. China’s halal food sector is still relatively less competitive, International Enterprise (IE) Singapore noted. This provides room for Singapore food companies to move in early and establish themselves, without facing competition from top global brands that have not yet ventured into the market. MyOutlets is one Singapore company that has ventured into the Chinese market. The company is a halal supply chain platform that allows halal food manufacturers and exporters to distribute their products through its value-chain channel. MyOutlets has joint ventures with a local Chinese company to set up an online and offline marketplace in China, with support from the Halal Industry Association. 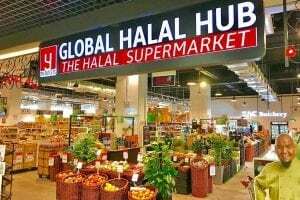 It will set up a halal supermarket in Beijing, followed by a chain of supermarkets in other provinces as well as the western corridor of China. MyOutlets founder Ronnie Tan expects sales of 180 million yuan (S$36.6 million) from the halal supermarket business in China in the first year, which will make up about 30 per cent of the company’s total revenue. In 2012, the company partnered Singapore-registered firm Sum Cheong Global to develop the DongGuan International Eco Food Hub to consolidate imported food products in China, but encountered challenges with the China Inspection and Quarantine Services (CIQ) over its stringent import rules and regulations. Mr Tan said: “The different provinces practise different rules and regulations in their importation procedures. The China government has received much feedback from government agencies and business owners about the CIQ import complications and has started looking at a standard importation procedure throughout the whole of China. Aside from regulatory control and licensing, another challenge is financing. In Qinghai province, 70 per cent of halal food companies reported a lack of capital as a hindrance to growth, citing difficulties in obtaining financing from banks and other channels. But Singapore players are still at the exploratory stage for expansion into Muslim-minority China as they do not have the same familiarity they have when dealing with Muslim-majority neighbours such as Malaysia and Indonesia, noted Shila Yatiman, executive director of the Singapore Malay Chamber Of Commerce & Industry. She stressed that having a network of partners – such as retailers, distributors, franchise partners – is key when trying to establish business in a relatively new market like China. A point which Chen Zhihao, centre director, China Group, IE Singapore, agreed with. “The experience of the local partners will also help Singapore food companies gain a deeper understanding of the market conditions and preferences and develop more competitive offerings,” he said. IE Singapore has taken steps to help Singapore companies explore China’s market through seminars and business missions, recommending specific provinces and connecting them to local partners to ease their market entry. With internationally-recognised halal standards and certification, Singapore companies can give consumers the assurance of reliable and quality food products, said IE Singapore. Singapore is also at an advantage when it comes to being multi-ethnic, and creating halal food options to cater to all taste buds. But China is still the biggest prize for halal product players here.